Pricing includes the glass & one colour/one position print. Setup Charge: $75.00 per colour. To view additional printing prices click below. 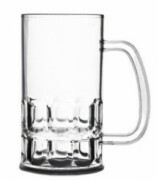 Pricing is for 285ml polycarbonate beer glass. Pricing includes 1 colour print. 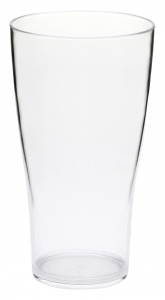 This 285ml Conical tumbler is the polycarbonate version of our Conical beer glass and is a great option for drink launches and general use in restaurants, hotels and bars. If you are after a basic, budget friendly, break free promotional glass, the Conical is where you should be looking. The 285ml size provides ample room for your logo print or brand and the simple design allows your logo or branding to stand out to all of your current and potential customers. 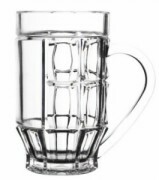 While the Conical Beer Glass is a great option for promotions and events, it is also a good one to look at if you need a good quality, basic beer glass for your wedding, engagement, corporate dinner or company bbq. The sizing and shape makes them a great option for all beverages, and they are suitable for everyone to use. If you are working within a budget but still want a traditional promotional beer glass that looks good and is well made, this is the glass for you.